Salt Fork Lake is a great place for a picnic along the water’s edge. When summer rolls around, everyone has thoughts of outdoor activities. 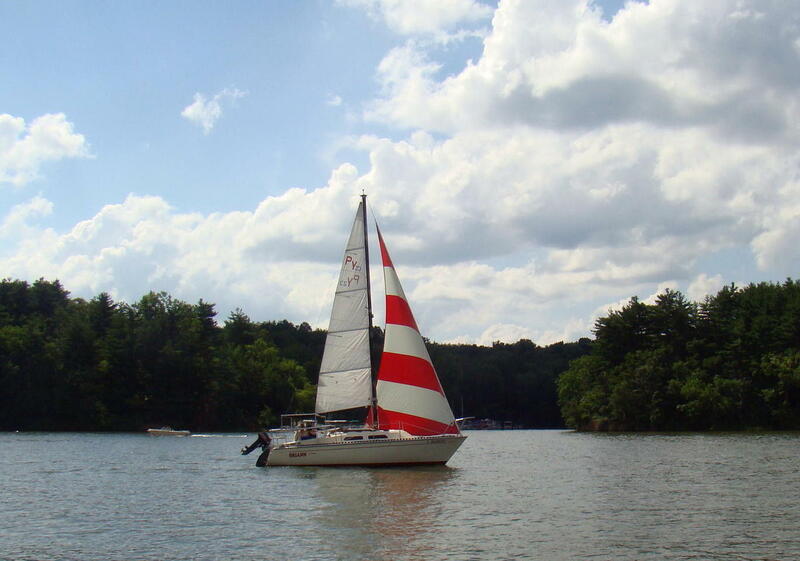 Whether you want to spend the day or a week, Salt Fork State Park, the largest state park in Ohio, holds a wide variety of activities that are sure to please the entire family. Many people in the area over the age of fifty will remember when this was farmland with Salt Fork Creek and many small streams running through it. In 1967, the earthen dam was completed and filling of the lake began. Bicycling is popular at the lake on trails or even on the roads as speed limit keeps traffic moving slowly. There are many choices for staying at the 3,000-acre lake for a few days. You can camp, rent a cabin, or stay at the beautiful Salt Fork Lodge. No matter what your choice, you will be surrounded by rolling hills and views of the lake. Cabins along the lake make for a relaxing get-away. The campground sites all have electrical hook-ups with a heated shower house close by. A few sites even have water and sewer hook-up as well. However, if you would prefer a cabin along the lake, all are completely furnished with a screened-in porch, and even have kitchen utensils. Salt Fork Lodge provides a great place for meetings or to spend the weekend. Some prefer the comfort and convenience of the exquisite, stone Salt Fork Lodge, which is perfect for meetings or vacations. Indoor and outdoor swimming pools provide entertainment no matter the weather. Outside you’ll find a fantastic playground for the youngsters as well as tennis, volleyball, basketball and shuffleboard courts. Special activities are scheduled throughout the summer months to keep youngsters busy with nature lessons, face painting, crafts, archery and guided hikes. There’s no reason to be bored here! Golfers enjoy the beautiful 18th hole in the rolling hills of Salt Fork Golf Course. Just a half mile down the road from the Lodge is the entrance to their 18 hole championship golf course, which is a challenge in these southeastern Ohio hills. A golf cart is highly recommended! Deer frequent the course and have little fear of golfers playing their game. Rates are very reasonable. Their expansive beach has a concession stand, putt-putt golf and Nature Center. No lake would be complete without a beach. Here the 2500 foot beach is one of the longest inland beaches in Ohio. When you want to take a break from swimming or playing in the water, take time to head to the concession stand, play miniature golf, or visit their Nature Center in the main bathhouse building. Sugartree Marina is one of two marinas where boats can be left for the season. 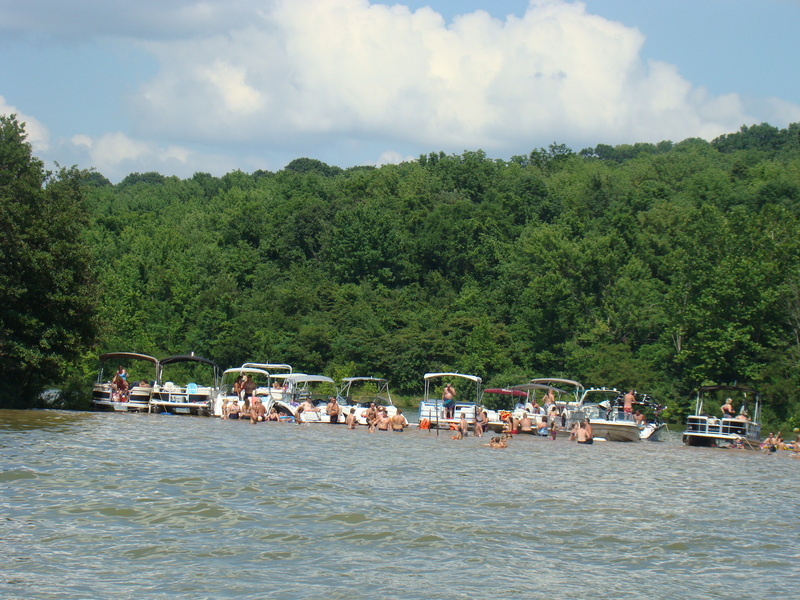 Two marinas, Salt Fork and Sugartree, provide a place to dock your boat for the season. If you prefer to bring your boat with you, there are ten easy access boat ramps. At Sugartree Marina, you can rent kayaks, canoes, wave runners or pontoons. There are so many ways to enjoy a day on the lake. Fishing can be a wonderful time for families to relax together. Fishing is a popular item at Salt Fork Lake. It’s a place you see families with their children as they teach them to enjoy being out in nature. Sitting on the bank or going out on a boat both give fishing enjoyment. Fresh fish over a campfire always become a great memory and a tasty meal. Walk carefully when exploring Hosak’s Cave. Bigfoot has been spotted here. Many people enjoy hiking one of their fourteen hiking trails from easy to moderate. One popular trail leads to Hosak’s Cave complete with waterfalls and wildflowers. Bigfoot is said to have been spotted in this area. Many bring their horses to the park to ride the peaceful trails. Others actually bring their horses to the park and camp for the weekend so they can ride twenty miles of horse trails. It’s a quiet place to ride through the woods on well-marked trails. Many ride bicycles and motorcycles through the paved roads of the park. It’s quite safe with a maximum speed limit of 35 mph in most places. Explore the historic Kennedy Stone House and root cellar while at the State Park. Another longer trail leads to Kennedy Stone House built in 1837. Stones used were quarried from the hills nearby and crafted in a manner that has stood the test of time. Original cost of the home at that time was $600. Recently, a road has been constructed to the house so you can hike, drive, or even arrive by boat. This overlook near the dam is my Inspiration Point, where many stories are written. The view from the dam in Morning Glory Area provides a great place to relax also. This is my Inspiration Point as often stories nearly write themselves while watching the waves hit the shore and seeing the boats bounce over the water. Building sand castles at the beach entertains youngsters between swims. 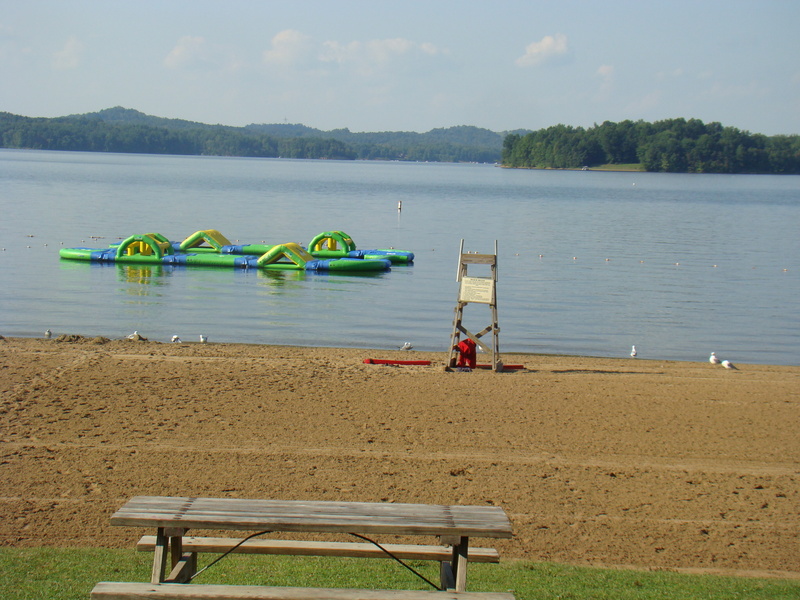 Salt Fork State Park provides a great place for family vacations as there are so many varied activities to keep all ages busy and happy. If you are lucky enough to live in the area, enjoy a day at the beach or a ride on the lake anytime. Pack a picnic and use one of their many shelters or picnic tables, or spread your blanket on the ground. It’s also the perfect place to relax and do absolutely nothing. Visit Salt Fork State Park to enjoy being surrounded by the beauties of nature. 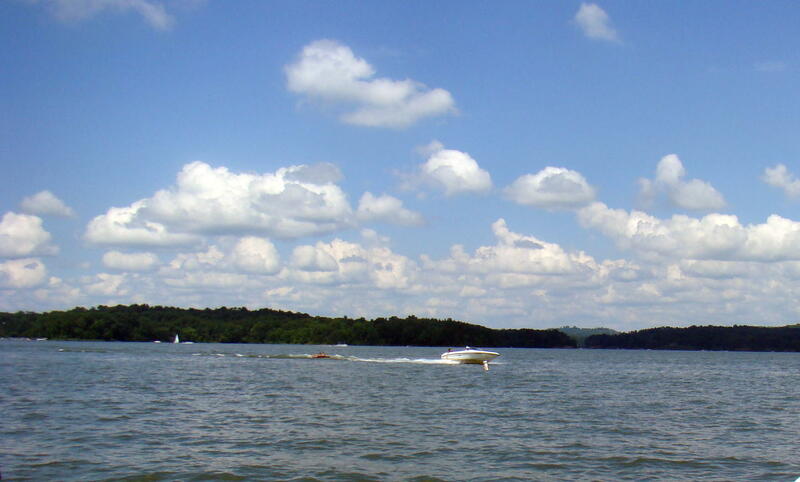 Salt Fork State Park is located about five miles north of Cambridge off US-22. The main entrance is on the left-hand side. Wooden signs throughout will guide you to the place you want to explore. This is an overview of Buckeye Lake Amusement Park as it appeared in the 1950s. Trips to Buckeye Lake Amusement Park can be remembered by many adults today. As children, they would head there with their parents or neighbors for a full day of rides along the lake. Almost everyone took along a picnic lunch. The first cabin built at Buckeye Lake has been restored next to the Buckeye Lake Museum. Today the Amusement Park is gone but the memories still remain at the Buckeye Lake Museum in Buckeye Lake. The museum opened its doors in 1998 and is located about a mile west of the original entrance to the amusement park. This 1918 Chevrolet 490 Touring Car brought visitors to the Cranberry Marsh Bass Club. Construction of the Ohio & Erie Canal gave a reason for Buckeye Lake to be created in 1826. This original swamp land had been left behind by a retreating glacier thousands of years ago. Buffalo Swamp was dug and dammed to create a source of water for the canal. The Crystal Swimming Pool was a gathering place for the entire family. When the canal became inactive after the railroads gave a better and faster means of transportation, the state developed Buckeye Lake as a popular resort. With over 3800 acres of water, 35 miles of shoreline and twenty islands, people began flocking to the area. Twenty-one hotels sprang up along the shoreline. Cars came bumper to bumper through this entrance gate to the park. The Ku Klux Klan had rallies at Buckeye Lake in 1923 when 75,000 people attended. Then in 1925, it is said that 500,000 KKK members attended since the Grand Dragon of the five-state area lived in Newark. The Dips Roller Coaster, which went over the lake, could be seen from the beach. After a few years, the lake seemed like a great place to add an Amusement Park. In 1931, “The Dips” Roller Coaster was built. This was a huge attraction as the roller coaster took passengers out over the lake. The roller coaster lasted until 1958 when a serious accident injured several passengers. It never ran again. This was the popular Rocket ride. Rides like The Whip, Big Slide, Dodge ’em Cars, Octopus, Wild Mouse and Rocket brought crowds to the lake. Folks enjoyed the taste of their Caramel Corn and Salt Water Taffy, which were shipped all over the country. Rides were part of the attraction for a visit to the amusement park. No wonder it was known as The Playground of Ohio with often 50,000 people in a single day. You could hardly get through the crowds, but still, people patiently waited bumper to bumper and shoulder to shoulder. A popular skee ball game can still be played at the Buckeye Lake Museum. Many companies held their annual picnics at Buckeye Lake Amusement Park. Guernsey County residents will recall RCA having picnics at the lake. Admission to the park was free during most of its operation, and later $2 a car. Every Thursday was Family Day when the cost of each ride was five cents for children and eight cents for adults. This was the machine that made their famous salt water taffy. Their Crystal Ballroom brought quality entertainment to the area. The “Buckeye Lake Waltz” was a popular dance tune. Louie Armstrong, Bob Hope, Sammy Kaye, Guy Lombardo, and Glenn Miller were among the names who appeared at their ballrooms. This was a happening place! Big bands also performed at Skateland, which had a 50,000 sq.ft. round floor. It was not unusual to have 2000 skaters there in an evening. A skeleton of a mastodon was found nearby. A cast of its head can be found at the museum. The park finally closed in 1970 after an attempt to revive it as a Country Western Theme Park. Just four miles down the road, when they were digging to build a golf course, they found the large skeleton of a mastodon, called the Burning Tree Mastodon, that is the most complete skeleton ever found. It’s estimated to be nearly 12,000 years old. A cast of the head can be found at the museum. Today, Buckeye Lake is still a great place for a boat ride, walk or picnic. Rides on the lake aboard a sternwheeler were popular even after the amusement park closed. But due to problems with the dam, the water level was not deep enough for the sternwheeler to operate. Queen of the Lake III sternwheeler is being refurbished for cruises on Buckeye Lake. In 2015, a new Queen of the Lake III was donated to the museum by Dr. Ronald and Cindy Downing of Zanesville. This sternwheeler can operate in less than two feet of water so the low level of the water in the lake will not affect it. Right now they are working on refurbishing The Queen of the Lake III into a dinner boat to help raise funds for the museum. Their dream is to have it on the water by late summer. This covered fountain in the construction zone is the only piece of the original amusement park that remains. The only piece of the amusement park that remains is the fountain, which still stands in the original park’s location at Alexander’s Landing. Perhaps you’ll want to visit there and let your mind wander back to those days of fun and excitement at the Buckeye Lake Amusement Park. You can still take a picnic with you! Buckeye Lake Museum is located off I-70 at Exit 129. Take OH 79 South aout two and a half miles to 4729 Walnut Road. The museum will be on the left hand side of the road. Drifting into a peaceful world is something everyone would hope to do. At beautiful Seneca Lake in the foothills of the Appalachians, this is not only a possibility, but a likelihood. Created in 1937, Seneca Lake Park in southeastern Ohio is part of the Muskingum Water Conservatory. This dam was originally constructed to contain floods on the Seneca Branch of Wills Creek. Here over 3,550 acres of water are filled with fish, boats, swimmers and fishermen! 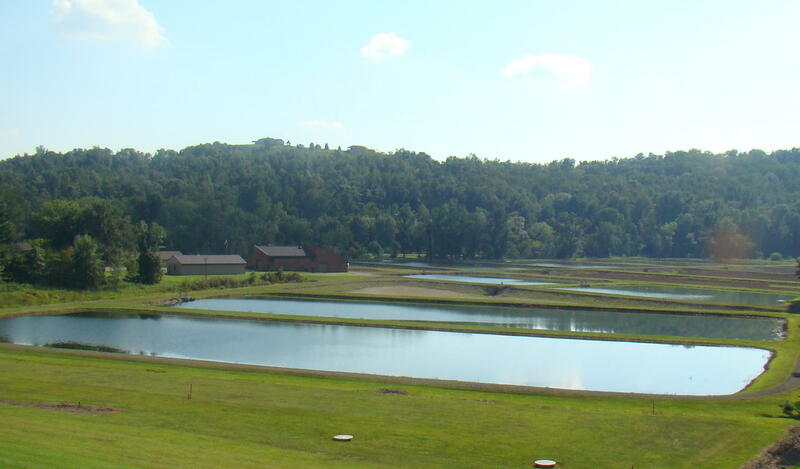 The main entrance to the park leads you past the dam and the fish hatchery, which has 37 one-acre ponds. Many call this their summer home, as cabins are frequent along the shores. Boat docks are placed nearby home locations, since most campers want the pleasure of drifting on the waters for a relaxing get-away. There are a wide variety of homes in this rural area ranging from small cabins to elegant residences. But perhaps you would rather rough it a little and stay in your camper or even your tent. There are 513 campsites available if you prefer getting back to nature. Some of those tent sites are located near the beach. If you are wanting a vacation from cooking as well, The Dockside Restaurant at the entrance to the campground provides delicious food with the choice of dining inside, or perhaps on the deck overlooking the lake.. If you are going out for the day, you might want to rent a canoe or kayak at Ray’s for a reasonable daily rate. Then you can guide yourself into the many coves, or float around the island where many stop for a picnic or party. There is a second swimming area called “The Bar”, where boats are anchored while children and adults jump overboard and enjoy cooling off in the fresh water lake. Water skiing is another popular summer time activity. One young man didn’t quite make the attempted turn and landed in the lake. When he climbed back on the boat, he was alarmed to find a blue gill in his swimming trunks. His friends won’t let him forget that story. Seneca Lake, the third largest inland lake in Ohio, is definitely a Gem in the Appalchian area. Seneca Lake Park is located approximately thirteen miles south of Cambridge off I-70. Take exit #37 to Buffalo and Senecaville and proceed straight ahead at the four way stop in Senecaville. The main entrance to the park it just a few miles down the road on the right hand side. Watch for signs!